This chart paper contains words that describe the Spanish-speaking families. The client still has that sheet up in their conference room months after the training. Guest blog post by Bego Lozano, who has lived and worked in different countries and cultures over the past 20 years. Right now, she calls home the Bay Area of California where she focuses on mindful leadership and coaching. As a fan and user of both Cultural Detective® and Personal Leadership®, I was delighted to learn that there is a tool called EPIC (Essential Practice of Intercultural Competence) that combines both. I recently used the EPIC Toolkit to design, deliver and facilitate a training for a California-based NGO that focuses on supporting those affected by Type 1 diabetes, an autoimmune disease that currently has no cure. This NGO had a unique challenge: funding for programs aimed at Spanish-speaking families had stopped with the 2008 financial crisis and had only recently returned. Their first attempt at organizing an event had fallen short of their expectations—both their internal expectations and those of their partners. They hired me to help make sure that didn’t happen again; they wanted to get the word out about prevention and treatment in powerful and meaningful ways. I turned to EPIC. The beauty of EPIC is that participants develop awareness into what they personally bring to their work, plus gain insight and understanding of the core values of a culture different than their own. Quite often we forget that as human beings we bring our own cultural lenses to everything we do, and understanding a situation from our own perspective only gives us, at most, half the picture. After an EPIC training, participants become more mindful of their own values and actions—why they respond in the ways they do. They learn to appreciate the values of the different culture, and most importantly, to build bridges to work better together. EPIC is not a one-time fix; it is a process of continuous feedback and change, a mobius strip that has space for constant improvement and nuances. It is about competence, and therefore it includes practicing relentlessly and compassionately. Last I checked, the programs for Spanish-speaking families were doing much better: employees had implemented small and significant changes that had increased participants’ engagement and comfort and their partner’s reported meaningful improvement. People were excited about their jobs and the positive impact they can have in their communities. If you’d like to learn more about EPIC or give it a spin yourself, it is available for license and is such a value! Ecotonos is a great tool! We would like to thank Nicole Martin of the Rocky Mountain Institute for this guest blog post about her work with a team from SEED: Sustainable Energy for Economic Development . We are honored and privileged to know our materials aid work of this kind! I just wanted to pass on some feedback. My group of 17 really enjoyed running Ecotonos: A simulation for collaborating across cultures and identified it as a highlight of our day. Team members from SEED drew some valuable insights and connections to their real life work from it. Since I had not seen Ecotonos run before, it is a credit to the materials that it went so well. I followed the directions and it worked! I really appreciated the clear and complete instructions. I also wanted to share a tweak that I made. In the acculturation section, I had them create visual identifiers for their groups using craft materials. It helped them acculturate and get talking and moving. Of course, my creative facilitation idea was sparked by forgetting the buttons back at the office 🙂 Here is a picture of a debrief. You can see the watch necklace (monochronic time group) and the mobius strip hat (polychronic time group) on the left side. To learn more about Ecotonos or to purchase the game, which you’ll be able to use for years to come and replay differently with the same group multiple times, click here. Emotional intelligence has been a major buzz word the last few years. Deservedly so; in this highly polarized world of ours emotional intelligence might be more valuable than just about any other intelligence. Obviously, interculturally competent people need to have emotional intelligence. We need to be able to understand why we respond the way we do, and channel our emotions in constructive ways. We need to be able to not get upset just because someone else does, and remain committed over the long term. It has long interested me, then, since emotions are so important to our happiness and success in life, why we don’t we, as average people, know more about them? How many words for different emotions can you list? Happy, sad, joyful, loving, aggravated… Take a moment to try it and see. Make a list of terms for different emotions. Capture quickly as many as you can. Organize the words you listed into major categories of human emotion, and give each of the categories a name. Rank the words you’ve listed within each category in order of intensity. Finally, link the categories of emotions to the behaviors they can motivate. Now ask your family members, friends, or team members to do the same. My guess is you’ll find some key commonalties and some significant differences. Definitely you will be able to have a fruitful discussion about emotions and how they are interpreted and expressed across your various cultural groups. The exercise above emerged after I came upon a resource some months ago that I have found useful in helping me reflect on and distinguish the emotions in my life. 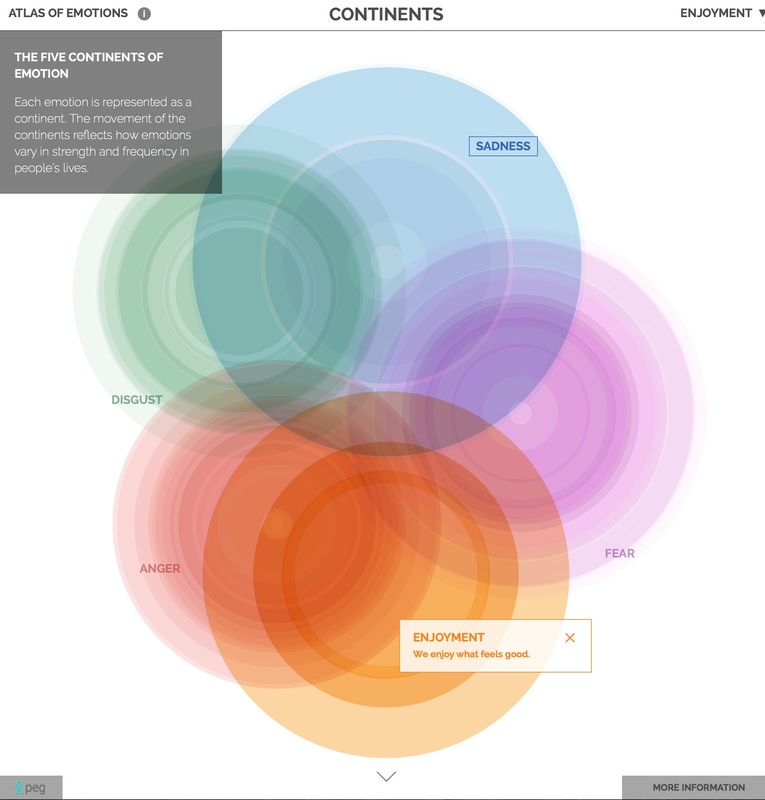 It’s called the Atlas of Emotions, and it’s a free online tool. The tool begins with five “Continents of Emotion:” Sadness, Fear, Enjoyment, Anger, and Disgust. I must say, I don’t like the ratio of four out of five negative emotions, but… Clicking on any continent tells you a core motivator of that emotion. Next you can go into “States of Emotion;” there are many states for each core emotion, and the tool ranks them in representative intensity. Third, you can click on “Actions of Emotion,” where we see what type of behavior we might take in response to the various emotions we feel. This to me is an especially powerful cross-cultural piece. The tool then takes us into the “Triggers of Emotion.” Click on any photo to enlarge it or view a slideshow. Let me say that the part about the Atlas of Emotions that quickly concerned me is in the biography of the lead psychologist behind the tool, Paul Ekman. He apparently “demonstrated the universality of facial expression of emotion, mapping all 43 muscle groups used in facial expression.” I have not taken the time to review themes recent literature on this subject, but if you are reading this blog, you no doubt are well aware that facial expression and expression of emotion are far from universal. I welcome anyone current on the subject to please enlighten us in the comments below. Despite this misgiving, I find the tool quite useful. It can be used for powerful personal reflection and learning, and it can be a terrific tool for discussing and reflecting on emotions across cultures—to understand more deeply, with more distinctions. I can see its use in conjunction with Cultural Detective Self Discovery, Cultural Detective Bridging Cultures, or any CD Worksheet analysis of critical incidents. In the end, if you use a tool like this simply to spark thinking, reflection, learning, and discussion, then the thoroughness, accurateness, or universality of the tool doesn’t matter that much. If you give this exercise a go, please come back and share your experience! World Refugee Day is June 20th, and I am honored to be able to share with you a powerful new game available free-of-charge to help raise awareness and understanding of the refugee and migrant experience. 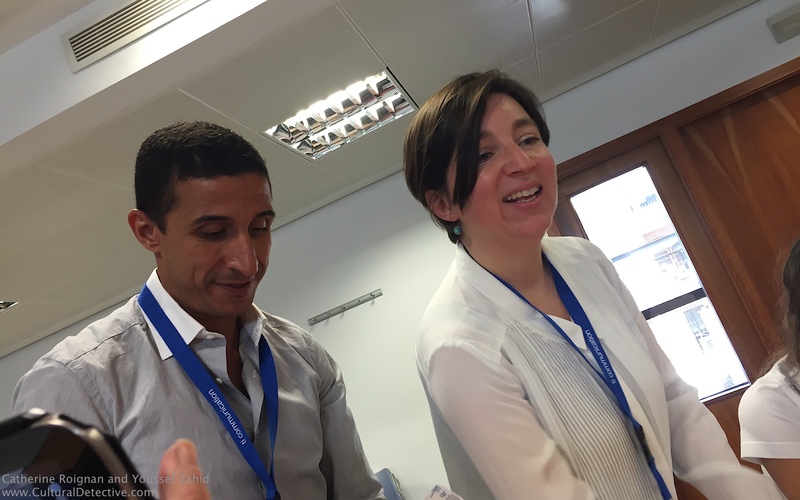 Catherine Roignan, co-author of Cultural Detective Morocco, conducted the game at the recent SIETAR Europa conference in Valencia, and it was my favorite session of the conference. Many people in the room had tears running down their cheeks, and in the days following we found ourselves often talking about the experience we’d shared. The game is called On the Road with Migrants, and it was created by Caritas France, the Association des Cités du Secours Catholique or ACSC. At the conference we had only a brief 15-20 minutes to play, but it was remarkable! Groups of us gathered at tables with game boards showing different continents of the world, including Africa, the Americas, Asia, and Europe. Each player had a pawn representing an immigrant, who was identified by name and story. We threw dice, drew cards and moved our pawns around the board according to the instructions on the cards and the dice. Kudos to Caritas France for their brilliant work on this! It is a terrific game! The materials are available for download free-of-charge; you print out the cards and boards, and add dice and pawns—1 die and 4 pawns (one color for each of four characters) per continent/board. Our SIETAR Europa group helped with the English translation—this is collaboration with a purpose! Learn more and download the game in French, English, Portuguese or German: En route avec les migrants. I am leading a team that is translating the game into Spanish. Please, share with us your resources and ideas for commemorating World Refugee Day and for building empathy for the migrant experience in this world of ours. Country Navigator™, GlobeSmart®, CultureWizard™, Cultural Navigator® and their logos are the property of their respective parent companies. We get calls and emails every day, asking us how Cultural Detective compares with some of the other intercultural tools on the market. Thank goodness people are passionate about developing intercultural knowledge and skills, and that there are so many intercultural tools available! That’s a big change in the last two decades, and a huge step in the direction of building intercultural competence in our organizations, our communities, and ourselves! Most of the well-known development tools in the field—Cultural Detective®, Country NavigatorTM, GlobeSmart®, CultureWizardTM, and Cultural Navigator®, among others, use a values-based approach to understanding cultural differences. Such a method has proven significantly more effective than a “do’s and don’ts” approach, because behavior depends on context. Thus, do’s-and-don’ts advice is frequently erroneous because it has little or no connection to a specific situation you may find yourself confronting. In addition to a shared focus on values, these tools share the aim of improving cross-cultural understanding. That, however, is about where the similarity ends. Comparing Cultural Detective and the other tools on the market is difficult because, according to leading intercultural competence researcher Doug Stuart, “it’s like comparing apples and oranges.” Both fruits are tasty, and they go well together in a salad, but they are oh-so-different on nearly every other criterion! Cultural Detective (CD) is a process-based tool designed to improve communication and collaboration. The other tools mentioned above are designed to compare and contrast cultures. There are strengths in both of these goals, and they can complement one another very well. But the differing goals make these tools fundamentally different species. Dimensions-based tools allow users to easily compare whether Chinese are more group-oriented than Japanese or Brazilians, and how we personally compare with the national averages of each of those places. The creators of the best of these tools conduct a lot of research to produce statistically reliable comparison data. According to Doug, the strength and weakness of a dimensional comparison (for example, where a culture or an individual stands on Hierarchy vs. Egalitarianism) is that we get a clear general picture of how different two populations may be, but no specifics on how that difference looks behaviorally. The numbers on the scales produced by these tools are culture-specific, but the categories are universal and broad. Cultural Detective helps develop skill and strategy, both culture-general and culture-specific. The core method is a process designed for use and practice over time, in specific situations and multiple cultures, so that it becomes second nature. Thus, Cultural Detective provides appropriate stimulation at all stages of intercultural competence development. Users develop critical thinking skills to discern similarities, differences, and how best to leverage them for mutual benefit. Cultural Detective is contextually grounded—the method centers on stories or critical incidents. This reinforces the need to understand people as complex individuals who are influenced by multiple cultures including gender, generation, professional training, sexual orientation, spiritual tradition, organizational and national culture, and lived multicultural experience—not just passport nationality. Cultural Detective looks at culture from the inside-out. Values Lenses focus on the core values natives of the culture hold near and dear. These are the same values that often confuse non-members of the culture and get in the way of cross-cultural collaboration. This approach enables a native, or someone very familiar with a culture, to explain the culture in a meaningful way to a newcomer. We might consider these Value Lenses as extremely culture-specific “themes” (internal discourse, logic or “common sense”) that are intimately tied to behaviors, and easily and meaningfully illuminated through stories. A culture is a unique expression of these themes, which are difficult or impossible to capture successfully within broad global dimensions. The other tools mostly look at culture from the outside-in, comparing national cultures according to well-researched categories such as Power Distance or Achievement/Ascription. A table of cultural dimensions that contrasts China and Japan tells you nothing practical about how people behave. Comparing Cultural Detective Values Lenses for China and Japan offers a completely different, immediately applicable line of inquiry: what are the underlying motivators of people’s behavior? Both approaches have their strengths, and many successful coaches, trainers, and educators use them in combination. Many of the other intercultural tools on the market provide users a self-assessment, which, when completed, statistically compares them with their home society and other cultures. Users love seeing themselves, their values and style, especially when correlated with numbers or illustrated in a chart—it’s interesting and engaging. Cultural Detective users reflect on their personal values, developing a Personal Values Lens that they can compare and contrast with those of team members, their own or other cultures. One approach is dimensions-based, the other based on qualitative analysis. Used in combination, one enhances the other. But they are two very different animals. Cultural Detective is not your father’s intercultural tool, to paraphrase an auto industry advert. It utilizes a “culture-specific” approach, while simultaneously building users’ “culture-general” understanding. It provides not just a knowledge base, but a personal skill base from which to strengthen intercultural competence. Best of all, it can be used in a variety of settings to help facilitate intercultural communication and collaboration. Our global team of 130 continues to work hard to collaboratively build a productivity tool that will deepen your learning and jumpstart your effectiveness. Give it a spin! Join us in one of our upcoming free webinars to learn more, and receive a 3-day pass to Cultural Detective Online! It is generally acknowledged that it is important to understand one’s own cultural values before we can begin to understand another’s worldview, let alone develop intercultural competence. Cultural Detective Self Discovery offers a way to investigate our own values through a series of guided questions designed to help us discover more about ourselves. Below is an excerpt from Cultural Detective Self Discovery by Dianne Hofner Saphiere, George Simons, and Kate Berardo in which we address various approaches to culture learning. Why learn about such a complex thing as culture? Certainly no one can learn everything about every other culture or even about one’s own, so why try at all? At a very practical level, having the ability to work across cultures is a key skill in daily life and the workplace. When we think about “culture” as different organizational departments, communities, regions, companies, nations, genders, or religions, we realize that we cross cultures daily and constantly. While we can never learn everything about every culture, what we can do is know our own values and how they affect us. We can be determined to go beyond auto-pilot thinking and to question our assumptions. We can approach working across cultures with curiosity and the intent to learn about others. Doing all this helps us to communicate more effectively and to avoid misunderstandings that lead to bad feelings and conflicts. In communities, this translates into greater cohesion. In the workplace, it means higher productivity, creativity, and synergy. Encountering people who see the world differently, act differently, and speak differently challenges us to understand others and become more open and creative. First of all, it is useful to know about people’s customs and habits, for example, when and how they greet others. There are many books on this topic, from professional studies to popular travel guides. There are videos and websites that help us know how to behave in everyday encounters with people who are different from us. Knowing what behavior is expected in particular situations can help us enormously—we can more quickly feel comfortable and blend in a bit, and we can prevent some unintentional insults. The downsides to this approach are that it is 1) difficult to memorize a long list of do’s and don’ts; 2) too easy to misunderstand which situations call for which behavior; 3) too easy to act stereotypically—in other words, the rules will not apply in all situations; and, of course, 4) most people do not expect outsiders to behave like insiders. Learning customs and habits is one way of getting to know others, but is not the only—nor necessarily the most effective—strategy. We can also learn the language of our colleagues, clients, students, or neighbors. This could mean anything from learning their slang or TLAs (three-letter abbreviations) to mastering Arabic, Mandarin, or Verlan. Language is, of course, a key to understanding how people think, how they see the world, and what is important to them. It is supremely valuable for communicating across cultures. But, learning another tongue takes a long time. Learning their language may not be a step that you have time to take before interacting with people from another culture. Yet, you will certainly benefit from picking up that phrase book and learning at least a few polite words. So what then? Another approach is to learn models of culture that help alert us to those areas where in our differences are likely to show up and where the differences will make a difference. For example, some people have a deep respect for authority and hierarchy—the boss is important and is to be treated accordingly, while other groups are very egalitarian—in meetings it is hard to tell who the boss is or even whether there is one. Or, you find that some people are likely to proceed on their own as individuals while others are inclined to act only when everybody in their group is in agreement. To catch sight of the broad range of differences within which people think and act, it sometimes helps to use the dozen or so dimensions of difference developed by Western intercultural researchers. These models can help us recognize, classify, and respond appropriately to differences. They are categories of the ways in which people may be different. But they do not necessarily tell us why these differences work the way they do, or how these differences are viewed by our colleagues and neighbors. We feel in control of our lives and our world, or if fate, destiny or other forces outside of us have a decisive impact on our lives. We think deductively or inductively. We focus, when we first work together, on taking action or on forming relationships. We believe that rules and laws apply uniformly to everyone, everywhere, or that rules and laws need to be applied differently in different circumstances. You can learn more about such categories from the work of Edward Hall and Geert Hofstede, who are among the pioneers of modern intercultural studies. A powerful way to understand the motives of others and ourselves is by learning about core values. As a Cultural Detective we want to know what lies behind peoples’ many differences and what drives the gestures, words, and preferences of the people with whom we interact. What better way to learn than to have people themselves tell us what they value and how it motivates them to speak and act? The Cultural Detective Method begins by looking at a culture’s core values as they are seen by the people in that culture and by people who have experienced the culture deeply. We encourage you to learn more about yourself and your core values via the Cultural Detective Self Discovery package. It has been used extensively by educational institutions, businesses, NGOs, and individuals throughout the world, and is currently available in a printable PDF format. We are pleased to announce that Cultural Detective Self Discovery will soon be available as part of your subscription to Cultural Detective Online. Watch here for details in the coming months! Do you know that Germany has become the world’s second-largest destination for migrants, according to the OECD? Are you interested in the migrant experience? Multicultural identity? Do you work with people in transition? 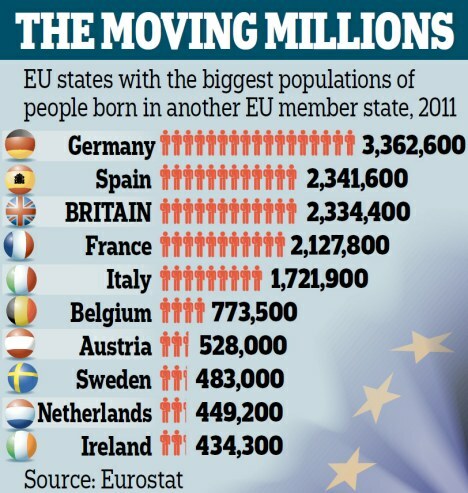 Are you particularly concerned with the challenges surrounding the changing demographics in Europe? Have you considered what a future might look like if we weren’t quite so limited by nation-state thinking? Then you definitely want to watch this terrific 23-minute movie, Migrants Moving History: Narratives of diversity in Europe, made with Hauptstadtkulturfonds out of Berlin. Even if you have seen it before, it is well worth your while. Though it was first aired back in 2008, the interviewees’ reflections on where they “belong,” on “betweenness,” on the differences between cultural and linguistic identity, and the benefits of multiculturalism, are thought-provoking; the video serves as a great starting point for discussion. As one interviewee says, “Everyone gains from multiculturalism. We need an open discussion about how societies can better facilitate that.” It got me to thinking: which societies in the world proudly define themselves as immigrant societies, as multicultural? How did they get there? And how can we get more members of more societies thinking and feeling that way? Let us know how you use Cultural Detective to make the most of multiculturalism where you live or work! Permission is granted to use this model freely and to circulate it, PROVIDED the © and url are maintained. It is said that experience is the best teacher. But learning does not lie in the experience itself; rather, it is our interpretation of the situation—the meaning we give to our experience—that provides our learning. How might we better enable learners to constructively give meaning to their intercultural experiences? Are you looking for an easy and highly effective way to structure your next intercultural workshop or coaching session? Are you wondering how you might better enable study-abroad students to understand their experience in a way that builds cross-cultural competence? Do you have employees working internationally or multiculturally, and you’d like them to learn to truly harness the potential of diversity? 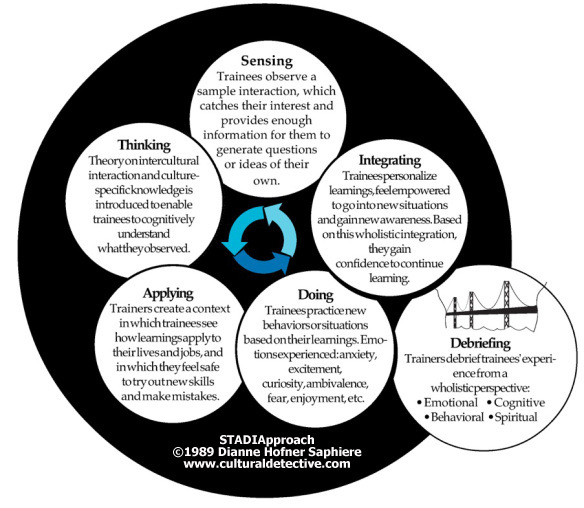 This “oldie but goodie,” the STADIApproach to Intercultural Learning, has been used in dozens of organizations worldwide with huge success. Click on the link to view a full article on the approach. I first published it for use with my proprietary clients in 1989; it is now even more useful as it can provide a design framework for blended learning approaches that leverage Cultural Detective Online. The CD Online system has STADI embedded into its core. In the hands of a skilled facilitator, teacher or coach, you can assist your learners to Sense, Think, Apply, Do and Integrate by analyzing the experience of others via the critical incidents in CD Online, as well as probing their own real life experiences. We trust you’ll find the STADIApproach article helpful! Please accept it and use it as my new year’s gift to you, this January of 2014. It is my wish that the new year will enable all of you, dear readers, to better facilitate intercultural understanding, sustainability, respect and equity on this planet of ours. Please share your experiences with us, and your designs that effectively leverage Cultural Detective Online to supplement your training, teaching or coaching endeavors.